UMEX :: External Fixator Systems :: Trauma :: Products :: Adler Mediequip Pvt. Ltd.
- Comprehensive, modular, elastic mini external fixator system. - Patient friendly, concept evolved over 8 patient years of research. - Low profile clamping elements allow comfortable interdigital placement. - Patented Teardrop design to ensure 3-point fixation of K-wires. - Knurled Rods provide high pull-out strength. - Treats fractures of the lower end of the Radius. - Reduction of complex fractures for the distal end of the Radius. - Multiple fractures of Hand and Wrist. 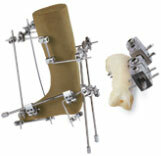 - Frames for fractures of the Foot and Ankle. - Multiple fractures of the metatarsals. - Mutilating injuries of the foot. - The distraction frame provides correction and maintenance of complex deformities of the hand and wrist, functional distraction-lengthening of amputated stumps. - The UMEX™ Club Foot frame is capable of addressing complex three dimensional multi-axial deformities and achieve progressive sequential correction. - The UMEX™ system corrects flexion-contractures of the fingers.